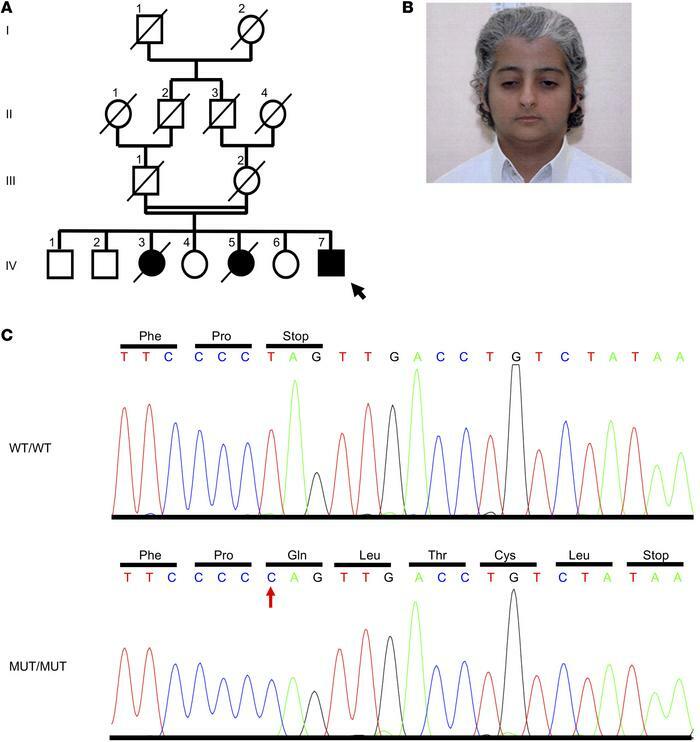 Identification of a causative mutation in MDM2. (A) Pedigree of a consanguineous family (black and white circles and squares denote affected and healthy individuals, respectively; arrow indicates the index patient; diagonal lines indicate deceased status; double line shows parental consanguinity). (B) Facial image of the index patient IV:7 at the age of 19 years. Note the patient’s short stature (151 cm on the scale), prematurely gray hair, pinched facial features with a narrow nasal bridge, and small mouth. (C) Sequence chromatogram shows the c.1492T>C (p.*498Qext5) mutation (red arrow).